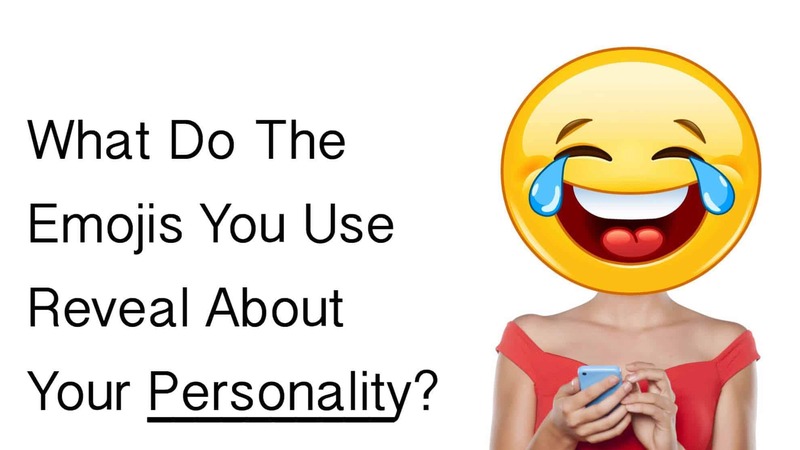 What Do The Emojis You Use Reveal About Your Personality? You might not think twice about the emojis you use in text and other messaging platforms, but they say more about your personality than you might realize. Emojis, or emoticons, serve several purposes when it comes to communication. For one, they help to reinforce emotions so that you can provide clarity to the recipient of the message. For another, they provide a fun, easy, fast way to communicate. Thirdly, many people need visuals in order to fully comprehend a message, so emojis can help eliminate confusion and unnecessary words through texting. Whether you know it or not, the emojis you use tell others a lot about you as well. In a way, emojis reflect our dominant personality and moods. For example, if you use sad-faced emojis frequently, you might have a more pessimistic personality, and vice versa with the use of happy faces. To prove this, several researchers decided to perform an experiment about emojis and personality. Read on to find out what your most used emojis say about you. Referring back to the study referenced above, the researchers first asked students to complete a questionnaire about themselves, and then have a text conversation with another participant using emojis. They also asked about the frequency of emoticons they used and why they chose them for communication. Finally, they took screenshots of the students’ Facebook profiles and recorded a 10-minute conversation between them and another unknown student through Facebook messenger. Not surprisingly, they found that people who rated themselves as likable and agreeable had a higher likelihood of using emojis on social media and in messaging. Also, they found that people who didn’t worry so much about how others perceived them used sad faced emojis more. Obviously, people use emojis that correspond to their individual personalities. People who have an outgoing, friendly, positive personality will likely use those emojis more often, and those who have the opposite personality will likely frequently use sad emojis. While not everyone uses emojis, they do offer a unique way of communicating with others. They can especially help with communication where people talk about a wide range of subjects, and the interactions have a higher degree of complexity than just a simple text message. Facebook, Tumblr, and similar platforms offer great examples of this. Other findings about the use of emoticons show how certain virtual environments seem more appropriate for their usage. Participants in the first study we discussed said that they used emoticons mostly in text or on social media, and less through email, likely because this mode of communication calls for a greater level of professionalism in most cases. Even if the participants couldn’t use emojis in all environments, they still reported that they enjoyed this way of communication and found it useful in conveying their messages. Some studies have even found that emojis can help those with poor social skills or a learning disability communicate with others better in a virtual environment. Going back to the study where students filled out questionnaires, the researchers then asked another group of people to study the conversations and profiles of the participants, and give their interpretation of the students’ personalities. They found that the more smiley faces the student had used, the more they seemed agreeable, conscientious and open to new experiences. However, this didn’t always match up with how the students actually saw themselves. This means that while people may use a variety of emojis, you can’t always figure out their personality through just pictures in texts or other messages. Sometimes, people have an entirely different online persona, but in most cases, you can catch a small glimpse of their personality in messaging. So, what does all of this mean? In a nutshell, your usage of emojis can usually provide a small snapshot of your personality. Don’t take it too seriously though; your real-world personality matters much more than people’s perceptions of you through messaging and social media.